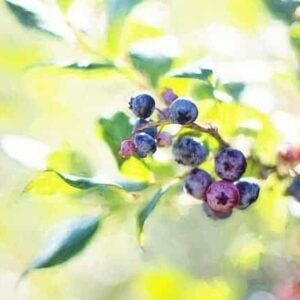 The highbush blueberrry thrives on the edges of Maine’s forest, along the banks of rivers running rough and clear. It needs a pH of 4.5 to 5.5 to thrive best. If you have areas with white pines and good water levels, it’s perfect for blueberries! A woodland’s edge gives them protection and the soil conditions that it requires. Good mulching and proper pruning will help them produce for over 20 years. The harvest is well worth the effort as abundant berries, up to 20 pounds per bush, will fill your hands and freezer with the most desired of berries.